For the past few months, I've been having pimples around the mouth area and it's been making me crazy ever since. It's been a problem for me since Day 1 and I can't help but feel vulnerable against the acne attack. I went to my dermatologist at Skinnovation for KI shots (steroid shots for acne to reduce swelling and speed up healing), she told me that I might be dealing with Peri-oral Contact Dermatitis (Acne and rashes around mouth and chin area). She recommended that I use a gentler toothpaste for the meantime. To check if my current fave toothpaste might be the reason for the breakouts. I didn't tell her I smoke which I think is one of the major reason for the acne invasion (although I think it's quite obvious that I should stop that either.). When I asked her what toothpaste I should purchase, she told me about VMV's Simple-Gentle Skin Saving Toothpaste. So off I went and bought myself one at VMV Hypoallergenics boutique at Bonifacio High Street. The Simple-Gentle Skin Saving Toothpaste is not your regular toothpaste. It has no minty flavor at all. To be honest, it sort of taste like Nestle Cream! It has a cream texture. At first I had trouble with the "no minty feel" because it makes me think I didn't brush my teeth at all. But I had to come to terms with it if only to ease my Peri-oral Contact Dermatitis. I didn't really think it was possible but with the first few days I was using this, my acne has sufficiently lessened! And currently, I only have a bump or two around the chin area! The concern I have was if I was really getting my teeth cleaned. So what I do about brushing my teeth? I touch my teeth and feel if it's quite squeaky and smooth. Good thing it is. But it definitely took a while before I got used to the taste of this toothpaste. 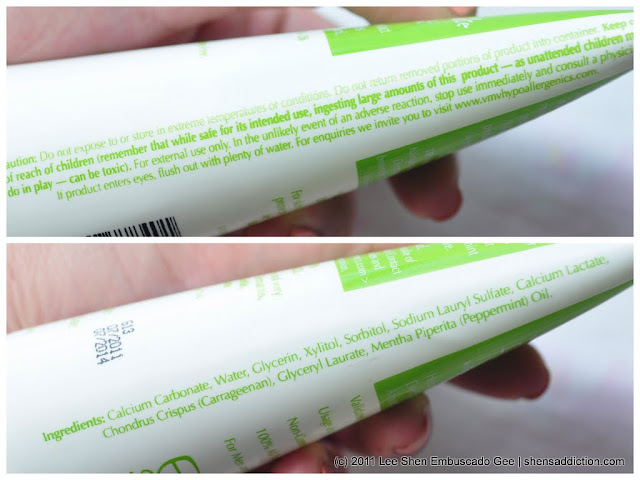 I love that this toothpaste only have a few ingredients. It really assures me that it is safe for the skin. I didn't realize until I got acquainted with this brand that Halogens, Fluorides or Dyes can cause acne and can really cause damage to the skin. Sigh... Unfortunately, many girls like me suffer from this. It's a good thing that there's VMV to help me out with this problem. Pam of VMV showed me that they have another variant of VMV Simple Gentle Skin-Saving toothpaste for those who want the minty aftertaste, the Skin-Sensitive Fine Fresh Toothpaste with natural peppermint. I've been using this every morning to rid of my AM breathe and to have that fresh feel in my mouth. The minty feel is very subtle and it lathers really well. It also cleans my teeth same as their other variant. If I'm in the mood for that familiar taste of a regular toothpaste, this one does the job. It's not too strong nor too much. Although this can never replace the overall feel of regular toothpaste, I'm glad there is a option for us who are constantly hounded by Peri-oral Contact Dermatitis. If your skin is a lot more prone to Peri-Oral Contact Dermatitis, choose the Simple-Gentle Skin Saving Toothpaste. But if you just want to maintain your skin free from pimples, then the Skin Sensitive Fine Fresh Toothpaste with Natural Peppermint is a nice choice. To be honest, I still use my regular toothpaste but not as often as I use to. I pretty much still love how it freshens my breathe but since my skin is too sensitive, I'm glad I have VMV to thank for creating toothpaste that heals and targets my acne problems. So if you're like me, suffering from acne around the chin and mouth area, consider getting a gentler toothpaste. It might be the cause. Better yet, visit your dermatologist so she can help you with your acne problem. 1. Eating too much spicy foods. 2. Cuddling with your pets. 4. Change your bedding and change your detergent to a milder one. 5. Wash your face with gentler facial soap or cleanser. 6. After brushing your teeth, wash your mouth area (where toothpaste foam have come in contact with) with facial cleanser to wash off toothpaste residue. 7. Limit your regimen to a simplier one and avoid using serums for the meantime. 8. Avoid unnecessary touching your face or resting your hands on your chin (your unsanitized hands might be causing the breakout. 9. Ask the BF to shave his beard or use a gentler facial soap. 10. Avoid making "beso" for the meantime until you've tamed down your acne. Right now, I'm pretty pleased that I have won the battle with my Peri-oral Contact Dermatitis. But living a life free from acne is too far-fetched for me. I know that it's a permanent deal that I will have acne for the rest of my life. I'm quite lucky though, that I have many products, treatments and procedures to help me out with this battle. Hi! How much is this and where is your derma's clinic? Thanks! i also loved this vmv toothpaste. pimple saver around my mouth.